Bill Clinton, seen here in New York last week, has been on the presidential campaign trail for Hillary Clinton. In a prolonged exchange Thursday afternoon, former President Bill Clinton forcefully defended his 1994 crime bill to Black Lives Matter protesters in the crowd at a Hillary Clinton campaign event. "I don't know how you would characterize the gang leaders who got 13-year-old kids hopped up on crack and sent them out onto the street to murder other African-American children," Clinton said, addressing a protester who appeared to interrupt him repeatedly. "Maybe you thought they were good citizens .... You are defending the people who kill the lives you say matter. Tell the truth. You are defending the people who cause young people to go out and take guns." The Clintons have faced criticism from BLM activists and younger black voters for months now over that bill, which they say put an unfairly high number of black Americans in prison for nonviolent offenses. After a protester interrupted him repeatedly, Bill Clinton began to take on that critique directly, making the claim that his crime bill was being given a bad rap. "Here's what happened," Clinton said. "Let's just tell the whole story." "I had an assault weapons ban in it [the crime bill]. I had money for inner-city kids, for out of school activities. We had 110,000 police officers so we could keep people on the street, not in these military vehicles, and the police would look like the people they were policing. We did all that. And [Joe] Biden [then senator and chair of the Senate Judiciary Committee] said, you can't pass this bill, the Republicans will kill it, if you don't put more sentencing in it." "I talked to a lot of African-American groups," Clinton continued. "They thought black lives matter. They said take this bill, because our kids are being shot in the street by gangs. We have 13-year-old kids planning their own funerals." Throughout the spirited defense of his policy, Clinton continued to be interrupted, and he repeatedly seemed to single out one protester. "She doesn't wanna hear any of that," Clinton said to the protester. "You know what else she doesn't want to hear? Because of that bill, we have a 25-year low in crime, a 33-year low in murder rate. And because of that and the background check law, we had a 46-year low in the deaths of people by gun violence, and who do you think those lives were? That mattered? Whose lives were saved that mattered?" For several minutes, the discussion of the crime bill, Clinton's exchange with the protester and the crowd's attempts to yell and chant over her were missing one thing: any mention of Hillary Clinton, the one Clinton running for president this election cycle. Bill Clinton did finally address her. "Hillary didn't vote for that bill, because she wasn't in the Senate," Clinton said. "She was spending her time trying to get health care for poor kids [referencing her advocacy for the Children's Health Insurance Program]. Who were they? And their lives mattered. And her opponent [Bernie Sanders] did vote for it. But I don't blame him either ... There were enough Republicans in the Senate to kill this bill, and nobody wanted it to die. That's what happened." "But she [Hillary Clinton] was the first candidate, the first one to say let's get these people who did nonviolent offenses out of prison," Clinton continued. "And guess what? A lot of Republicans agreed. They know they made a mistake." Clinton went on to further defend his administration, referencing the financial crisis: "It reminds me of when the Republicans try to blame me for the financial meltdown." He turned back to his wife and said: "This election is about the future. They're trying to blame her for something she didn't do. So I'll tell you another story about a place where Black Lives Matter? Africa." The former president went on to speak of his wife's work fighting AIDS in Africa while secretary of state. Late Thursday night, NPR spoke with Philadelphia resident Erica Mines, one of the protesters at the Bill Clinton event. "I'm not mad at Bill Clinton," Mines said. "I'm not mad at him as a person, he's a human being. But his politics are very wrong." She said of her actions yesterday, "I don't necessarily like the term protest, because that's not what we planned to do," Mines said. "We did plan to express ourselves freely." Mines said after Hillary Clinton supporters in the crowd began interacting with her the situation became tense and words were exchanged, leading to the escalation captured on camera. Mines said in the moment she was not focused on Clinton's responses to her, but after the event she read up on exactly what he said. Still, Mines says her mind was not changed. "I still feel the same way about Bill Clinton... He completely beat around the bush." She continued, "Whatever policies and platform that she's [Hillary Clinton] running on now, [Bill] Clinton is definitely a part of that." "Bill Clinton is a politician," Mines continued. "He did his job, which was to counteract anyone who wants to talk to him or point out the truth about exactly what he did to affect our community." You know, so much has changed since the Clintons lived in the White House. And those changes complicate Hillary Clinton's presidential campaign. 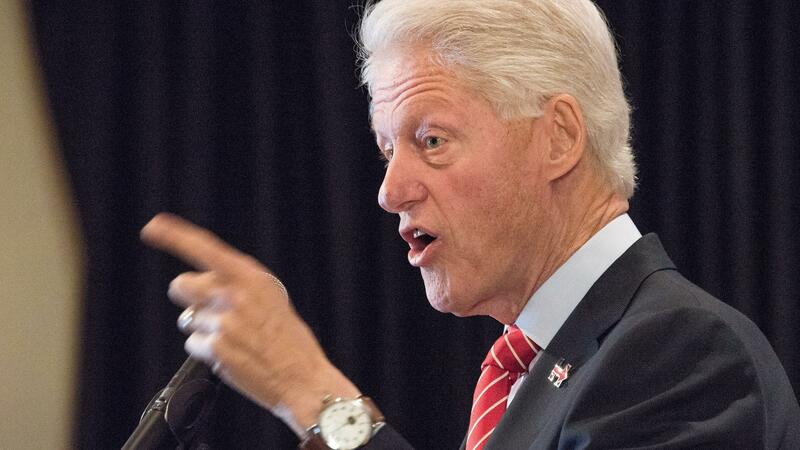 Bill Clinton presided over tremendous economic expansion. He also signed a 1994 crime bill, praised at the time but criticized by the protesters who confronted President Clinton yesterday. Here's NPR's Sam Sanders. SAM SANDERS, BYLINE: When he's on the stump for his wife, Bill Clinton often just riffs - no notes, no teleprompter, just the man himself. But yesterday, that ability to improvise - it was tested. BILL CLINTON: Wait a minute; wait a minute. SANDERS: A few minutes into speech in Philadelphia, a small group of black protesters interrupted Clinton. B. CLINTON: OK, I heard it. Can I answer? No, you see, here's the thing - I like protestors, but the ones that won't let you answer are afraid of the truth. That's a simple rule. SANDERS: This back-and-forth went on for about 10 minutes, mostly about the impact of Bill Clinton's 1994 crime bill. Critics say it hurt black communities and put a lot of black people in jail for nonviolent offenses. But Clinton said there was actually a lot of good in the bill. B. CLINTON: I had an assault weapons ban in it. I had money for inner-city kids for out-of-school activities. We had 110,000 police officers so we could put people on the street, not in these military vehicles, and the police would look like the people they were policing. We did all of that. SANDERS: Clinton said the bill helped lead to historic lows in crime rates, and that a lot of black voters supported it. He also took time to address what's become a lingering critique of his wife. In 1996, Hillary Clinton said this about some of the young criminals that crime bill with targeting. SANDERS: Hillary Clinton has since said she regrets her use of that word - super predators - but on Thursday, Bill Clinton seemed to stand by it. B. CLINTON: I don't know how you would characterize the gang leaders who got 13-year-old kids hopped up on crack and sent them out onto the street to murder other African-American children. Maybe you thought they were good citizens. She didn't. She didn't. SANDERS: That visual could be problematic - Bill Clinton at a podium looking down at a black woman, wagging his finger at her. Paul Butler teaches criminal law and race relations at Georgetown Law School. He says for black voters, what they saw in that moment might depend a bit on their age. PAUL BUTLER: Economically, there hasn't been a better time for African-Americans than the Clinton era. So I think a lot of older African-Americans have this romantic view of when Bill Clinton was president - that things were better. SANDERS: Butler says it's different for young people. BUTLER: A lot of young folks don't remember that. But what they are very aware of is this air of extreme police violence against African-Americans, mass incarceration and a time when African-American families are actually downwardly mobile. SANDERS: There was one person in particular I wanted to talk with about all of this. ERICA MINES: I'm not mad at Bill Clinton. I'm not mad at him as a person. He's a human being. SANDERS: That's Erica Mines. She was one of those protesters yesterday in Philly. Did any of that change your mind on how you feel about his policies and his presidency at all? MINES: No. I still feel the same way about Bill Clinton. SANDERS: Regardless, the entire interaction was one thing Hillary Clinton does not need right now - a distraction. Sam Sanders, NPR News. Transcript provided by NPR, Copyright NPR.